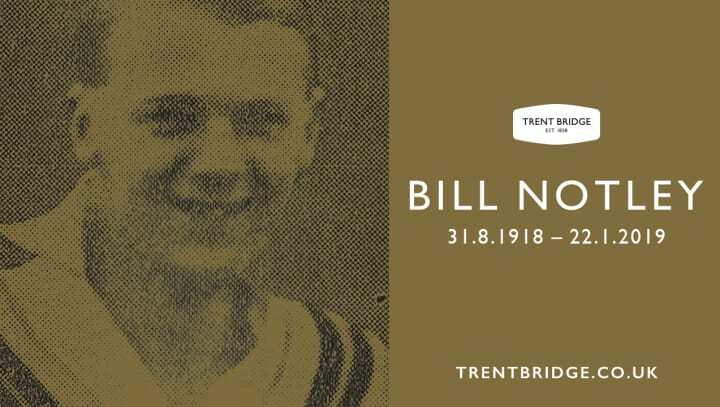 On August 31st, 2018, Bill Notley celebrated his 100th birthday, the first Nottinghamshire cricketer to do so. Sadly we have to report that he died in his sleep on January 22nd, 2019. Notley, who was born in Nottingham was a very good all-rounder at club level, being a major force for the Casuals Cricket Club from 1934 to 1962. He played in 27 Minor County between 1949 and 1955, captaining the side jointly with H.R.Cox in 1954 and 1955. His best bowling performance was against Warwickshire at Edgbaston in 1949, when he took nine for 86 in the first innings. This feat resulted in his being selected for Notts 1st XI v Surrey at The Oval in August 1949. It proved a very disappointing match for both Notts and Notley. On a plumb wicket he captured a single wicket for 90 – Surrey only lost six wickets making well above 400. In dreadful weather on the second afternoon, Notley failed to score. He did not get a chance of a second bowl or innings, since the last day’s play was washed out. The match proved to be his only Championship game. In addition to cricket he represented Nottinghamshire at hockey, captaining the county. A notable golfer he was a member of the Stanton Club and at one time had a handicap of 3. An amateur sportsman he was employed by the County Council, retiring as Deputy Director of Social Services, a post later filled by Mick Newell’s father.